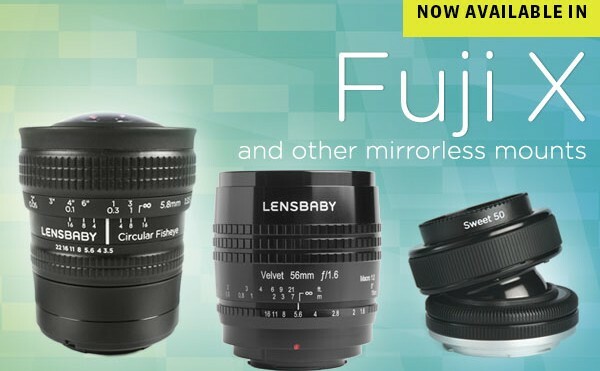 Lens baby has just announced the release of their Velvet 56, Circular Fisheye, and Composer Pro with Sweet 35 or Sweet 50 are now available in Fuji X, Micro 4/3rds and other mirrorless mounts. Their Velvet 56 classic portrait lens gives you a velvety, ethereal start with a smooth finish, from the big picture to the smallest details. Bringing modern-day simplicity to the carefully crafted build and look of mid-20th century portrait lenses, this 56mm f/1.6 manual portrait and macro lens evokes an experience like no other. Images from these lenses can be stunning, allowing the photographer to easily go from capturing gorgeous, radiant environments to intimate details in the same scene. The Lens Baby Circular Fisheye lens can narrow your focus while broadening your horizons. Using this 5.8mm, 185° multipurpose lens, you can widen your view or focus ¼” from the front of your lens. The Composer Pro optic lens system with Sweet 35 Optic lens puts the spotlight on the subject at a wide focal length. This 35mm lens offers smooth, fluid operation that lets you shoot a spot of sharp focus surrounded by blur. Additionally the Composer Pro with Sweet 50 Optic lens helps you frame subjects and freeze time. Using it to play with light-bending blur at a versatile 50mm focal length, you can set ordinary images into motion.